Ahhhh. Finally I have my computer and my car back in working order. It's been a rough couple of weeks. Took my car in because it wouldn't start and only $900 later it still wouldn't start! So back to the shop it went, me, kicking and screaming! Hubby, at this time decided to upgrade computer, cleaning out the old and installing the new, and of course nothing is as simple as it should be. I went a total of 7 days without a car or computer. Imagine! So I turned to an old friend that I haven't had the desire to see in years....my sewing machine. I have been dying to sew a doll for quite some time but just didn't want to deal with the mess of sewing. Dragging the machine out and having the ironing board up for days just doesn't sound appealing to me. But drag it out I did and surprisingly we got along quite well! 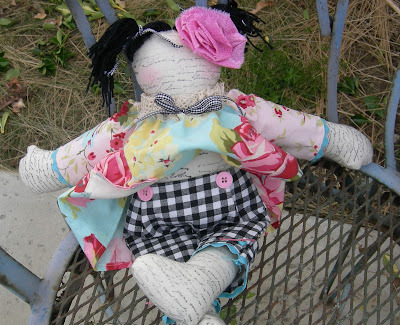 I bought some fabrics from Lil Urchin at the last Chateau de Fleurs show thinking I would make a doll someday. Well that day came when I was stuck at home in the rain with no car or computer to distract me. Fancypants was soon born! I decided to make her body look like my art so I stamped muslin with black permanent ink using a french script stamp. I wish her sleeves were more of a contrast than the rest of her dress but I still like her.﻿ Most of my girls have oversized hair embellishments so I put a giant fabric rose in Fancypant's hair and of course she has just a touch of blush on her cheeks but no face. In the middle of all this, I received a package with a tote that I had my art printed on. I set out embellishing it with whatever stuff I could find in the craft room. I stamped flowers in the background and used some old clooney lace and buttons that I found from my 70's stash that I had from my days when I worked in the garment district. I had to laugh at my 22 yr old son that told me to make sure I put plenty of pockets on it! So there are 2 pockets on the front, perfect for a cell phone and lots of paintbrushes. All in all, my friend the sewing machine and I had a pretty good time but my favorite part of sewing is all the hand sewing that can be done in front of the tv watching talk shows or home improvement shows which I don't allow myself to do often. I will be selling the bag at Chateau de Fleurs this coming weekend but Fancypants isn't going anywhere. I can't part with her. Perhaps she will sit in my Christmas wreath this year. Oh Julie, this is so FuN ! 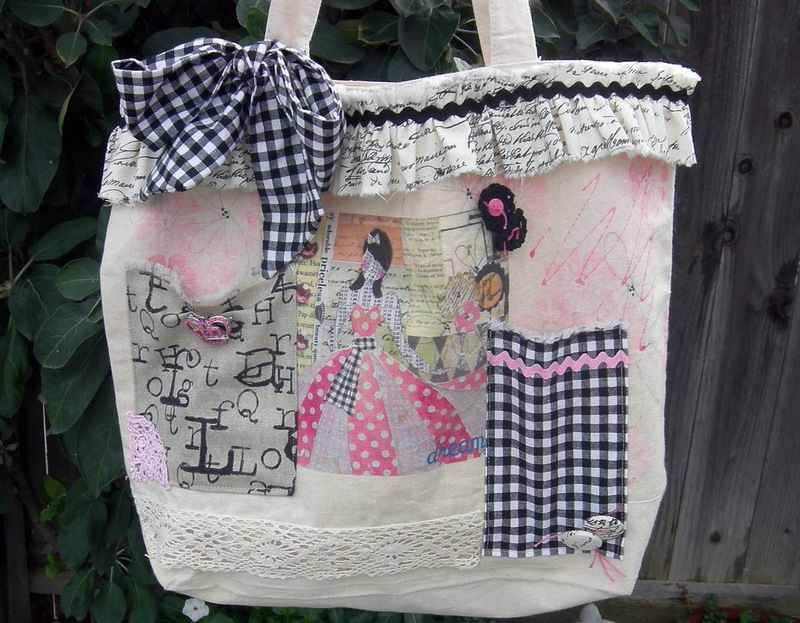 A whole line of adorable JN Designs coming out in time for your book signings !!! may the licensing agent appear next. I'm thrilled for you ! So cute! I love your beautiful designs. Did you finish the piece for the little girl who likes horses? Are you able to share? I'd love to see it. i would love to see a photo of her in that wreath! what a fabulous idea! i always admire your creations, julie! at Chateau! Emily and I are both EXCITED!!! thanks girls! Yes Lisa, I will be posting a photo of her this week. I really liked the way it turned out. Lisa L...looking foward to the weekend! I have read this post featuring your Darling 'Fancypants' she is sooooooo cute. You are certainly a very talented seamstress to have designed such a beautifull doll pattern. I'd love to know if you are planning to offer the pattern as a download? If so how much would it cost? Thanks for sharing your gorgeous creations. Mrs 'Muddlhead' me clicked to post comment before I had commented on your gorgeous bag. It's sooooo pretty. Will you by any chance be offering a tutorial and or a download for this too. If not maybe you are planning another book full of Goodies?